A comment from loupmojo warrants its own reposting, so those who have already seen my blog today will see it as well. 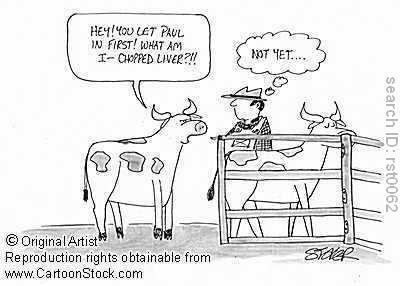 It is a perfect humorous illustration of my chopped liver post! Thanks, loupmojo. Hilarious. This entry was posted in Bad Boys, Inequality, Men and Women and tagged Daily Post, Daily Prompt, farce, Humor, injustice, invisible women, Judy Dykstra-Brown, men and women, The Daily Post on October 16, 2014 by lifelessons. The first time I can remember feeling unequal was in college, in Modern American Literature class. I remember the teacher (male) asking questions and I would usually raise my hand and answer first. I would make a point about whatever we had been reading and there would be a moderate reaction on the part of the teacher and the mainly male members of the class. Half an hour later, after much discussion, invariably, one of the male members of the class would repeat what I had said as his own opinion and everyone would laud what he had to say as insightful and brilliant and everyone would agree! This happened time after time. It was as though none of them really listened to what I said, or perhaps that their minds weren’t ready to accept it unless they went through a period of inductive reasoning first and they needed all the accumulated comments of the class to bring them to acknowledge what I had known from the beginning. What it felt like, however, was that they put no credence in the ideas of a woman. This is not the only time I have noticed this. It happens now and then in the small poetry workshop I am a member of. I am really curious about whether any other woman has ever noticed this same phenomena. The Prompt: Unequal Terms—Did you know today is Blog Action Day? Join bloggers from around the world and write a post about what inequality means to you. Have you ever encountered it in your daily life? This entry was posted in bigotry, College memories, Inequality, Men and Women and tagged Daily Post, Daily Prompt, Inequality, Judy Dykstra-Brown, remembrance, The Daily Post, writing on October 16, 2014 by lifelessons.